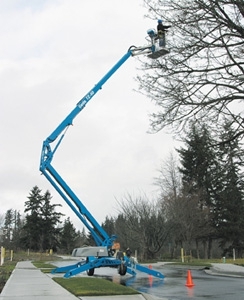 Genie trailer mounted Z-booms (trailer mounted cherry pickers) feature the unique Genie automatic levelling system for self-levelling on slopes up to 11 degrees, on any type of terrain. Both ground and platform controls feature easy to use, self-intuitive controls making it quick and easy to operate. The Genie TZ range is built to make service simple, including easy access to batteries. Simply release the clamp and remove the cover. Road towable boom with max height of 12.36m and 200Kg lifting capacity. Hydraulic outriggers automatically level up to 10.5 degrees in 40 seconds. 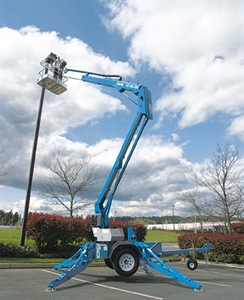 Larger road towable boom, with a max height of 17.09m and also the ability to add the optional drive feature and engine.